Today, medievalists have to understand that the public and our students will see us as potential white supremacists or white supremacist sympathizers because we are medievalists. The medieval western European Christian past is being weaponized by white supremacist/white nationalist/KKK/nazi extremist groups who also frequently happen to be college students… What are you doing, medievalists, in your classrooms? Because you are the authorities teaching medieval subjects in the classroom, you are, in fact, ideological arms dealers. So, are you going to be apathetic weapons dealers not caring how your material and tools will be used? Do you care who your buyers are in the classroom? Choose a side. You really have no excuse to address whether your medieval studies is a white supremacist medieval studies or not. You also do not have a choice in whether you are part of this debate because the debate is already prevalent and public. Our students are watching and will make judgements and calls on what side you are really on. I suggest overt signaling of how you are not a white supremacist and how your medieval studies is one that does not uphold white supremacy. Neutrality is not optional. But maybe the only “problem” is your own warped perception of reality? Apparently the “alt-right,” whatever that is, takes inspiration from the Middle Ages (and from the Classics too). They like the idea of Crusaders cracking Muslim skulls, and they also like to contemplate a Europe before the advent of mass non-European and non-Christian immigration. But how many people are we actually talking about here? And how big of a problem is this, really? People can idealize any era of history that they want, for whatever reason they want. We always feel sad when other people don’t share our enthusiasm for our subject – well, here are people who love the Middle Ages! How about harnessing that enthusiasm and nudging it towards the academic consensus – on the off chance that one of these types should actually appear in our classrooms? It’s really no different from how one treats students who idealize ancient Egypt, Native Americans, the Caliphate, matriarchal prehistory, or pseudo-history of the Da Vinci Code variety. You accept the students where they are, and gently explain that their vision of the past might not be entirely accurate – and you make sure to explain that whatever happened in the past doesn’t necessarily make for good policy today. I really don’t believe that “the public and our students will see us as potential white supremacists or white supremacist sympathizers because we are medievalists.” I think that most ordinary Americans are fully capable of distinguishing between professors of medieval studies and young men dressing up as Knights Templar. It would not occur to them to think that we are endorsing the Charlottesville rally, any more than we are endorsing Knight Transportation or King Arthur Flour (or, for that matter, that the classics department is endorsing the Atlanta Gladiators or the American Legion). To suggest that they can’t is condescending and rude, and more than a little self-dramatizing. In fact, I would say that Prof. Kim’s post is an example of Joseph Epstein‘s observation that much in current academic life is “either boring or crazy,” and for whom publishing an article about it was like “opening the blinds to reveal the baboons at play, as if to say, ‘Betcha didn’t think their behinds were quite so purple as that. '” Most people roll their eyes at the sheer craziness of much academic dispute, and shed no tears when politicians cut our funding. So let me turn Prof. Kim’s invitation on its head: what have you done, medievalist, to combat this craziness? What have you done to prove to Middle America that your discipline and profession deserve to be taken seriously? 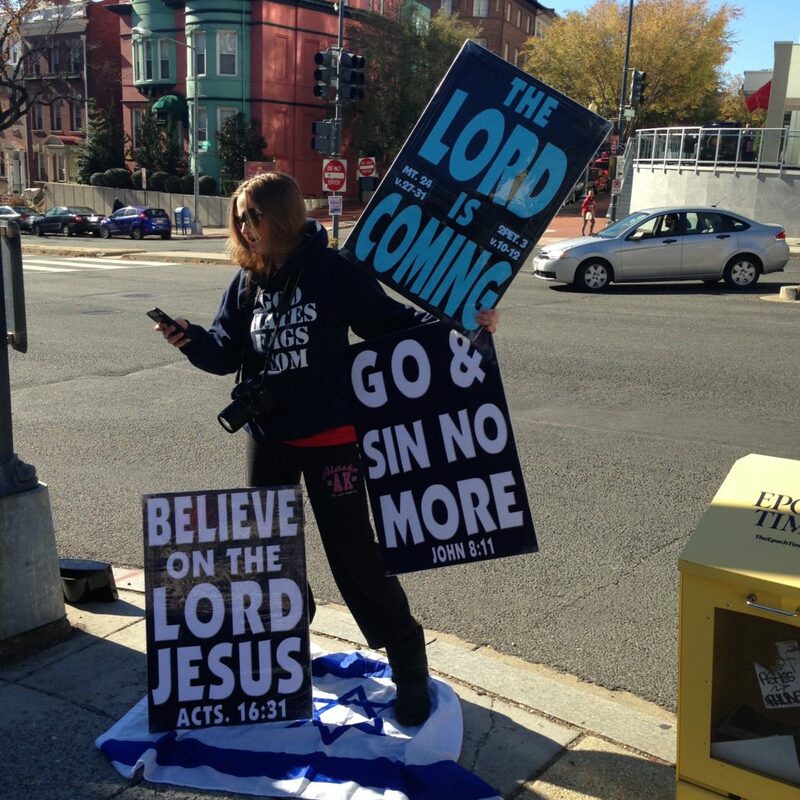 While in DC, I was surprised to find actual members of the Westboro Baptist Church across from my hotel, practicing their peculiar ministry. 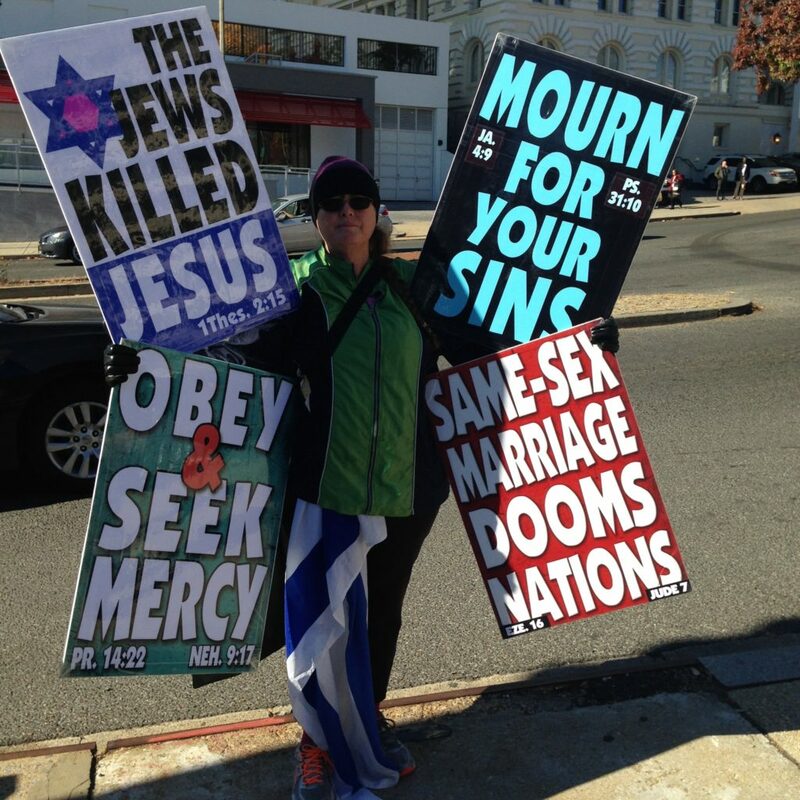 They normally picket events like funerals; I do not know what in particular they were protesting here. 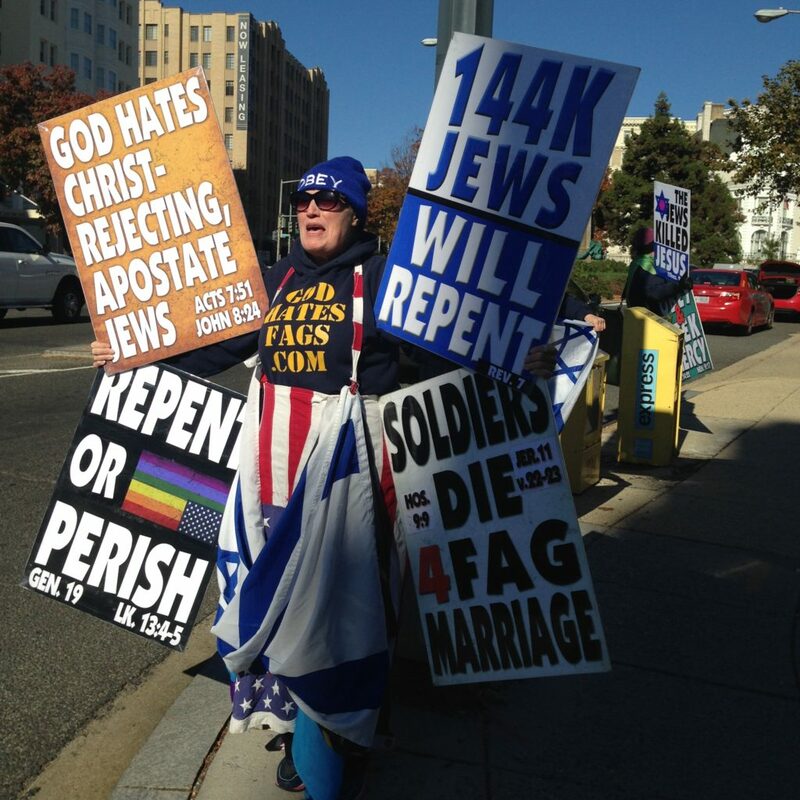 Everyone knows about their tagline “God Hates Fags,” but I did not know about their anti-Jewish/anti-Zionist animus. This is in contrast to the pro-Zionist dispensationalism prevalent in American Evangelical circles (although note that they believe that 144,000 Jews will be saved, per Revelation 7).